Click one of the tabs to see more information! Decide which method of fixing you require, either TOP FIX or FACE FIX. The blind has been supplied with universal fixing brackets to top fix into the ceiling / lintel directly above the blind or face fix onto the wall or window frame directly behind the blind. Take a measurement of how far your window handles protrude from your window frame (mm) then add 20mm to that measurement, this is the distance from the window frame you will need to drill to avoid the slats catching your window handles. Use a pencil to mark where the brackets will be positioned. Fix the brackets in the exact place that you took your original measurement from. Use a pencil to mark where the brackets will be positioned. Note: You cannot face fix into a recess with protruding window handles as there is no space available to allow the blind to hang correctly. If this is the case you will need to use the top fix method. Pull the swing arm of each bracket towards the centre until it is protruding outwards. 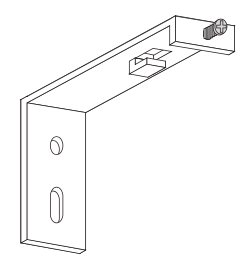 Locate the headrail between the front and back lips of the bracket and push upwards. Carefully push the swing arm back towards the headrail so that they fit flush and lock the rail in place. Repeat on other brackets. Hook the wand into the control tilter and hang down vertically (ensure wand is not over tightened). To lower the blind, pull the cord across the face of the blind to release the cordlock and let the cord slide through your fingers until the blind reaches the desired height. Twist the wand control to adjust the angle of the slats. Slats should be in the open position when raising or lowering the blind. The safety cleat should be installed as close to the headrail as possible and not less than 1500mm from the floor. The cord must be fully gathered around the safety cleats when the blind is idle. Distance between the cleats will vary dependent on the drop of the blind. This will allow the cord to fully gather around the cleats when the blind is fully raised. See guide to the left. Place the safety cleat in position using above guidelines and mark its hole locations. Drill the marked holes, and secure the safety cleat to the wall using suitable screws and fixings. Tightly wrap the cords around the cleats in a figure of eight. WARNING: In the interest of safety, please keep all pull cords and chains out of the reach of children. Move cots, beds and other furniture away from blinds and install safety devices such as cleats and cord tidies to limit access to cords. Before you begin, ensure there is a clearance of 6mm all around the outside of your window beading to allow enough room for the Perfect Fit (Fig.1). Measure the width and the drop of your glass size accurately with a digital measuring tape. We recommend that you measure in both corners and the middle of your window and use the smallest size taken (Fig. 2 & 3). Step 3. measure window depth. Measure the depth of the window (Fig. 4) using the depth gauge. This gives you the measurement from the face of the window frame to the glass (this is normally 18mm/20mm/24mm) and will determine the size of the window fixing brackets to be used. assembly instructions. Step 4. fitting to corner pieces. All Perfect Fit Frames are supplied with the blind built in place on the top frame or to the bottom frame if skylight or pleated options are selected. The top, bottom and side frames will need to be assembled. This is achieved by sliding the side frames on either side into the pre-fitted corner pieces of first the top and then the bottom frame. 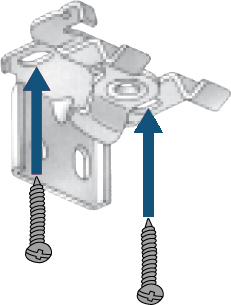 Securing at the back using the screws provided (Fig. 5 & 6). If skylight or pleated options are selected the headrail will need to be clipped into the pre-fixed clips. Your frame is now ready for installation.. Step 5. insert window fixing brackets. For the correct spacing distance (85mm) place a credit card into the corner of the window (Fig. 7). Line up the window fixing bracket at the base of the card (or top of the card depending upon which corner of the window you are working) and fit the bracket by pushing it between the glass and the rubber seal of the window (Fig 8). Using the credit card guarantees a perfect line up for each of the holes in your frame and with each of the brackets (Fig 9). Fit any intermediate brackets accordingly.. Step 6. fix frame to window. 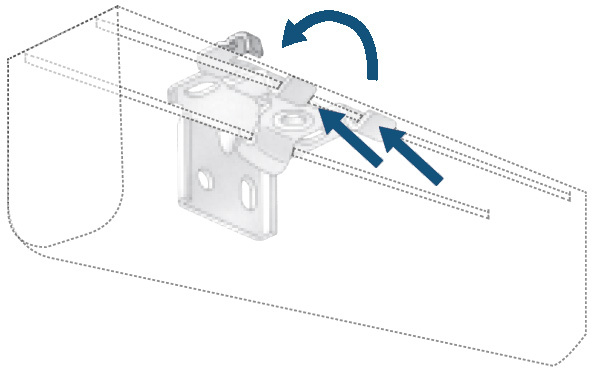 Line up the holes in the frame with the window fixing brackets (Fig 10). 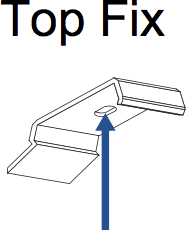 Firmly press down the frame onto each bracket on one side at a time to ensure easier installation (Fig 11). Your blind is now installed..
Blinds fitted to windows with handles may require packing pieces to be inserted between the framework and the handle. This is to stop the handle from touching the frame when operated. There are two different lengths available. Lift the handle to an upright position and remove the screw caps (Fig 12). 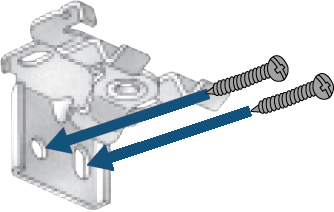 Unscrew the handle from the frame (Fig 13). 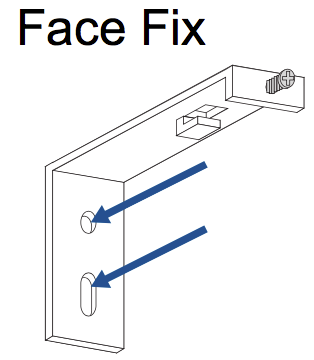 Place the packing piece(s) inbetween the handle and the frame (Fig 14). Re-fit the handle (Fig 15). Your blind can be made to fit the inside of the recess of your window or it can hang on the outside. Exact. This measurement is required when you want your blind to hang outside the recess. Your blind will be made to these measurements. (please see measuring instructions). Recess. This measurement is required when you want your blind to fit inside the window recess. We will make the adjustment for you and your blind will be made to fit into the recess. (please see measuring instructions). 1. 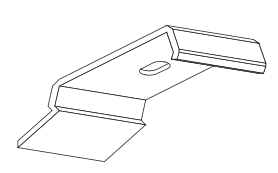 Measure the width of the recess from wall to wall in three places as shown. Then take the shortest measurement as your width..
2. Measure the drop by measuring from the top of the recess to the window sill in three places as shown. Then take the shortest measurement as your drop.. Note: When measuring Recess please take note of any obstructions like Tiles, Dado Rails, Skirting boards etc that may alter the actual width of the recess.. Measuring For An Exact Blind Size. Follow these instructions for blinds that you want to hang outside the window recess:. 1. Decide how much you want your blind to overlap and then provide the exact measurement of the Width you'd like your blind to be. 2. Decide how much you want your blind to overlap and then provide the exact measurement of the Drop you'd like your blind to be. Please be aware that on roller blinds there is a mechanism at one end (which controls the blind) which means that the fabric is actually 35mm less then the blind size. On recess blinds you just need to provide the recess measurement as normal and we will make the adjustment. On Exact blinds decide how much you want the blind to overlap allowing extra for the mechanism. If you order a right hand stack, your control wand will be on the right hand side of your blind when open. If you order a left hand stack, your control wand will be on the left hand side of your blind when open. If you order a split stack, your control wand will be in the centre of the blind and will open to the right hand side. The length of the control wands will be as follows. If you require a different length wand, please contact us with your requirements. 2. Measure the width and the drop of your glass size accurately with a digital measuring tape. We recommend that you measure in both corners and the middle of your window and use the smallest size taken. 3. Measure the depth of the window using the depth gauge (alternatively place a piece of wood across the frame and measure the distance from the wood to the glass. This gives you the measurement from the face of the window frame to the glass (this is normally 18mm/20mm/24mm) and will determine the size of the window fixing brackets to be used. Make sure the controls are on the side ordered and tilt the track to locate the back section of the headrail into the bracket. Push into position and tighten the short screw to lock the track into place. Repeat this process with additional brackets. The track must be set with the controls at the side ordered, tilt the track and locate the front lip of track into the front of the bracket push up until it clicks into position. Repeat this process with additional brackets. Your vertical blind is fully compliant with the latest safety standards. It has been supplied with a mono control wand that hooks onto the mechanism. This controls the opening and tilting of the blind. Hook the louvres onto the rail. With our system all the louvres are already chained. Firstly position the hooks at 90° to the track, take the louvre roll out of its plastic protection, remove the band and unroll them with the hanger at the top and the stabilising chains at the bottom. Hand the louvres so that the seams are all facing the same way. If you have a split bunch blind you will need to cut the chain between the middle two louvres in order for the blind to be able to draw to each side. Only do thi once the louvres have been positioned correctly. Draw the blind to separate the middle two louvres allowing you to easily cut the chain between them. The pull control has been positioned as you requested when ordering. If you need to swap the side that the controls are on, change the roll direction or if you need to further trim the blind, simply unplug the controls from the tube. This should be done before you fix the brackets. The blind has been supplied with universal fixing brackets. Decide which method of fixing you require, either face fix the blind onto a wall or window frame, or top fix the blind onto the underside of a recess or ceiling. Once the brackets have been fitted, insert the blinds pin into the bracket (the pin is located at the opposite end of the blind controls). The control end will then fix into the opposite bracket. There are two directions for roller blind fabric to immerse from their tube, these are known as ‘standard’ or ‘reverse’. Standard sends the fabric down via the back of the tube, placing it closest to the window or wall it is mounted on. This method creates less light leakage when the blinds are mounted outside of a recess. Reverse places the fabric at the front of the tube, therefore concealing view of the pole. This method allows extra space for window handles and other obstructions if you mount the blind inside a recess. To alter the roll direction, the fabric must be fully unrolled so that the tube is revealed. Continue turning the tube in the same direction so that the fabric starts to roll up to the opposite side. To get the fabric to sit closer to the tube, run your hands along the fabric to loosely form a fold, and continue rolling the fabric back up. All Roller blinds are fitted with safety breaks. If you are fitting additional devices they must be installed at the maximum distance possible from the control mechanism to prevent looped cords becoming slack. 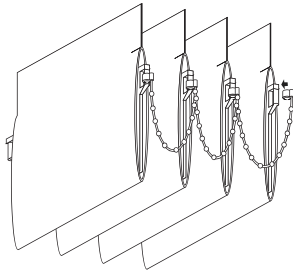 Ensure the chain is fully taut when placed into position. Attach the retaining device using suitable fixings ensuring the device is fully closed.